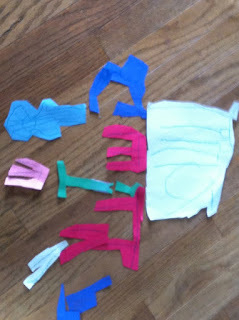 Wil has been creative of late, drawing and cutting out a variety of things using construction paper. I love his imagination. Then he made a band. The instruments: drums, guitar, bass, tuba, keyboard, microphone. And the band members. Complete with stage curtains. Bots and vehicles from Transformers Prime. Transformers he made for Sam. And one of the best things? He has made some for Sam so they can play together. Sam playing Ben 10 aliens. I can't wait to see what he comes up with tomorrow. We still have a lot of construction paper.